A fibromyoma, or myoma, is a type of growth commonly found inside the womb, or uterus uterus, and is formed from fibrous tissue and muscle. Sometimes known as uterine fibroids, or simply fibroids, fibromyomas are not cancerous but are benign tumors, which are thought to affect at least two out of every five women and which can occur singly or in groups. Often, fibroids cause no symptoms, but heavier periods, abdominal pain and swelling, constipation, or a frequent need to urinate may occur. Even though fibromyomas are noncancerous tumors, if symptoms become serious, treatment may be necessary. Fibromyoma treatment may involve using drugs to shrink the tumors, or one of a range of surgical and non-surgical techniques may be employed to remove them. Women who are in their 30s and 40s, and those who are overweight, are more likely to develop fibromyomas. The tumors vary in size, and can be too small to be visible or large enough to occupy all of the uterus. Although the cause of the tumors is not known, a fibromyoma is more likely to grow when estrogen levels are higher. For this reason, a fibromyoma may slowly enlarge while a woman is still having periods, but may shrink after menopause, when estrogen levels fall. A fibromyoma of the uterus may develop inside the muscular walls of the womb, in which case it is called an intramural fibromyoma. 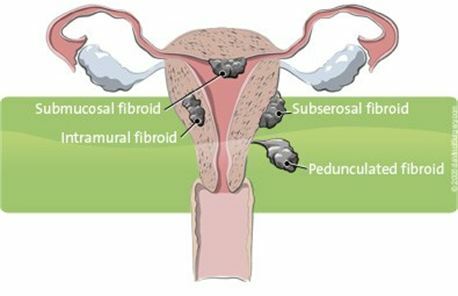 Submucosal fibroids grow beneath the womb’s inner lining, while what are known as subserous fibromyomas arise from the outside of the uterus and may become huge. Occasionally a pedunculated fibromyoma, a type of fibroid which grows on the end of a stalk, may develop from the outer uterus wall. Recently research has proven that fibromyoma can occur in young women below the age of 30 years. The evaluation of uterine fibroids begins with a history and physical exam, including a pelvic exam. · diagnosis of fibromyomas is usually made using an investigation such as an ultrasound scan. Fibromyoma treatment is only necessary if symptoms are troublesome. A drug known as GnRHa, or gonadotropin releasing hormone agonist, may help shrink the tumors, but it is not generally taken long term due to side effects such as osteoporosis, where bones become fragile. Most women who have uterine fibroids have few if any symptoms. Small uterine fibroids may not require treatment if they do not cause symptoms. Treatment for large uterine fibroids may include hormone therapy, surgery to remove the fibroids, or hysterectomy. Fibroids that cause heavy vaginal bleeding can lead to significant anemia that may require treatment. o Gonadotropin-releasing hormone agonists cause menstruation to stop, causing fibroids to shrink. o May cause side effects such as weight gain, depression, anxiety, acne, headaches, and excessive body hair. o Can improve fibroid symptoms, but does not shrink them or make them go away. Non-surgical procedures such as UAE, or uterine artery embolization, reduce the size of fibromyomas by removing their blood supply. Endometrial ablation removes the womb lining and cuts away fibroids close to the surface of the uterus. For large fibroids, an operation such as a hysterectomy may be required, where the whole womb is removed. If women wish to have children later, an alternative method called a myomectomy may be carried out, where fibroids are extracted through the cervix, or through an incision in the uterus, sometimes using keyhole surgery techniques.